They’ll love digging into the delicious surprises inside this tower of gifts! 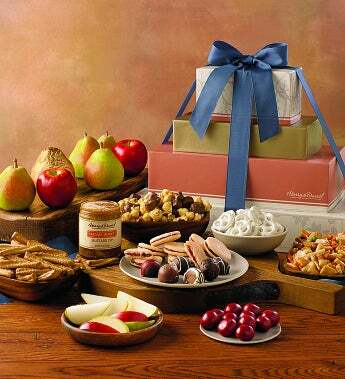 Each level is filled with gourmet treats, such as famous Royal Riviera® Pears, Moose Munch® Popcorn, velvety chocolate cherries, truffles, and raspberry galettes. Topped with a hand-tied bow, it’s perfect for gift-giving. 6 Royal Riviera® Pears; approximately 2 lbs. 3 oz. 2 Seasonal Apples; approximately 15 oz. Milk chocolate Moose Munch® Gourmet Popcorn; 10 oz. Signature Truffles (Coffee, Cherry, Raspberry, Almond, All Dark, Double Chocolate); 4 oz. Total Net Weight: 4 lbs. 11 oz.